GEZE UK has provided a breath of fresh air to an extraordinary facility which boasts academic excellence and innovation. 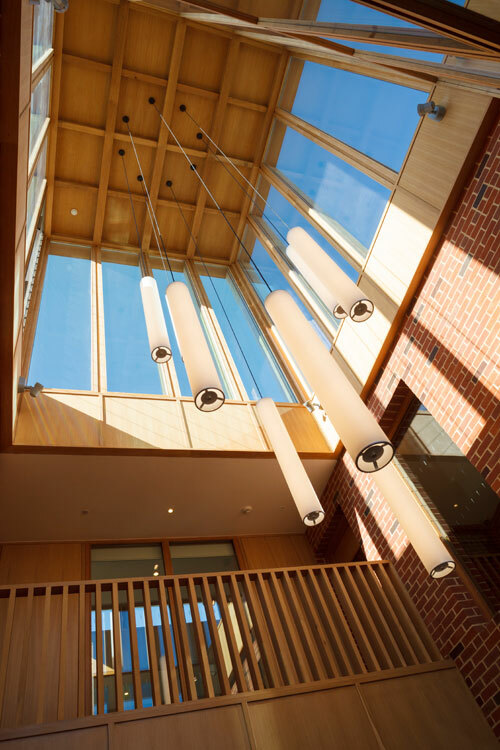 The refurbishment of West Court – part of Jesus College, Cambridge – incorporates GEZE’s natural ventilation system to create the ideal learning environment. It is integrated into four areas of the development, including a conference room with the iconic Lantern Tower, lobby and reception area, and uses GEZE’s award-winning Slimchain automatic window drive and is managed by the WS 1000 indoor climate building control. This is connected to a weather station and together they balance internal conditions such as air quality, temperature and humidity with external elements such as rain and wind speeds to achieve desired requirements. Experts believe that improving indoor air quality by utilising natural air flow significantly improves cognitive performance – ideal for a building which houses the College’s new Intellectual Forum, a spearheading research organisation that applies critical-thinking to global problems. GEZE UK provided a full suite of natural ventilation products which include Slimchain window actuators for outward opening vents , DMS 5 open/close controllers, temperature sensors, weather station and WS 1000 touch screen controller. The Slimchain actuator range is extremely versatile and an ideal choice in creating a climate control package. It has a broad range of applications and meets diverse requirements for varying loads, upstroke lengths, opening widths and the widest range of installation types. With a maximum upstroke of 800 millimetres, it achieves a large aerodynamic opening width, meaning that it can also be used in natural smoke and heat extraction devices (SHEVs) in line with EN 12101-2. Its discreet design proved to be the perfect accompaniment to architect Niall McLaughlin’s design which combined organic aesthetics with the exacting demands of functionality to create a multi-purpose development within an historic setting. West Court was a three-phase development which involved the renovation of existing buildings and incorporated part of the historic Wesley House. This was a red-brick training college for Methodist ministers designed by Maurice Everett Webb but in the 1970’s, a section spanning the city’s medieval King’s Ditch, was filled with a contemporary building. The McLaughlin practice was given the task of envisaging a new frontage for the Jesus Lane infill along with new parts to the building after winning a competition when the project got underway in 2014. It was funded, in part, by donations and bequests. 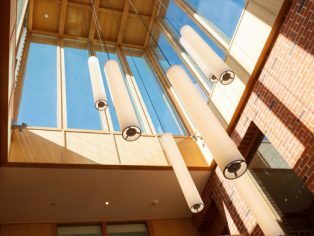 McLaughlin has used natural ash to clad the building and this flows through to its interiors which not only provides a natural look but also helps to minimise noise within auditorium areas from the busy road outside. The windows can be concealed by wooden louvred shutters which are a design feature repeated around the building. These are not only part of the aesthetic, and a possible nod to the building’s historic setting, but have practical uses including adjusting light levels when staging lectures and presentations. an academic centre with lecture theatre that seat 180 people, a suite of meeting and interactive rooms equipped with state-of-the-art audio visual facilities and offices for research staff. West Court is also home to the Cambridge Peking University China Centre. Andy Howland, GEZE UK’s Sales and Marketing Director, said that he was thrilled that GEZE’s natural ventilation and indoor climate control system was incorporated into such a landmark development.